What’s better than making a prize-winning meatloaf recipe? Improving on it. 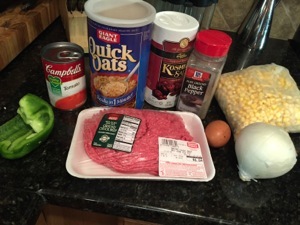 This great meatloaf recipe was merely the base for a few additions. I added the green pepper and some corn. With my additions, this was right at the top of my loaf pan. Heat oven to 350°F. In large bowl, combine all ingredients, mixing lightly but thoroughly. Press into 8 x 4-inch loaf pan. Bake 1 hour to medium (160°F) doneness until not pink in center and juices show no pink color. Let stand 5 minutes; drain off any juices before slicing. 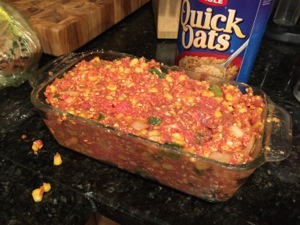 Serving Tips: Customize meatloaf by adding one of the following to meatloaf ingredients: 1) 1/2 cup frozen (thawed) or canned (drained) corn 2) 1/2 cup chopped green or red bell pepper 3) One 2-1/2-ounce jar sliced mushrooms, drained 4) 1/3 cup grated Parmesan cheese 5) 2 tablespoons finely chopped fresh parsley or cilantro Sprinkle top of baked meatloaf with 1 cup shredded cheese. Return to oven for 3 minutes to melt cheese. Spoon heated prepared spaghetti sauce, pizza sauce, barbecue sauce or salsa over each serving. 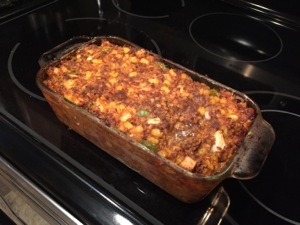 I love meatloaf…comfort food from my childhood plus great for sandwiches. Will try this version. 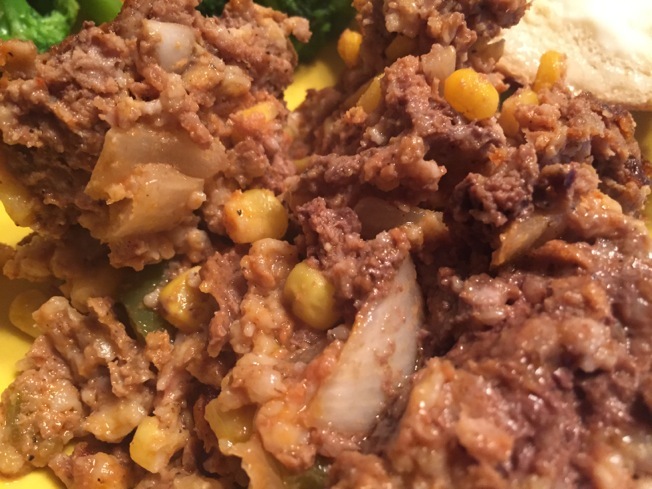 THE OPTIONS TO THIS MEATLOAF ARE APPEALING, AND WORTHY OF TRYING.